This trip has been.. interesting. The drive from my house to Ewing, Illinois is approximately 14 hours. We had some truck trouble in Maryland and ended up backtracking to get to the nearest dealership as soon as possible. I waited in line at the facility to sign my papers for three hours, a very very longtime. Long story short, were loaded up and headed home. We will probably arrive around 3am. Tomorrow is Day One. I plan to touch him! 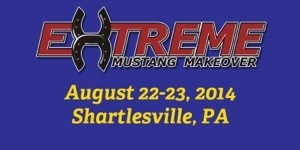 I will be competing in the Pennsylvania Extreme Mustang Makeover this year!! May 14th I am required to be in Illinois to pick up my newest friend. Let me tell you how many emotions are flying right now. 1 Determination. Now I know what to expect and I hope that I can do well this year, if not better than last. 2 Excitement. Horses are my passion and always will be. Having the opportunity to be responsible for and care for another is plenty to make me happy. 4 Worry. I live in New Jersey. 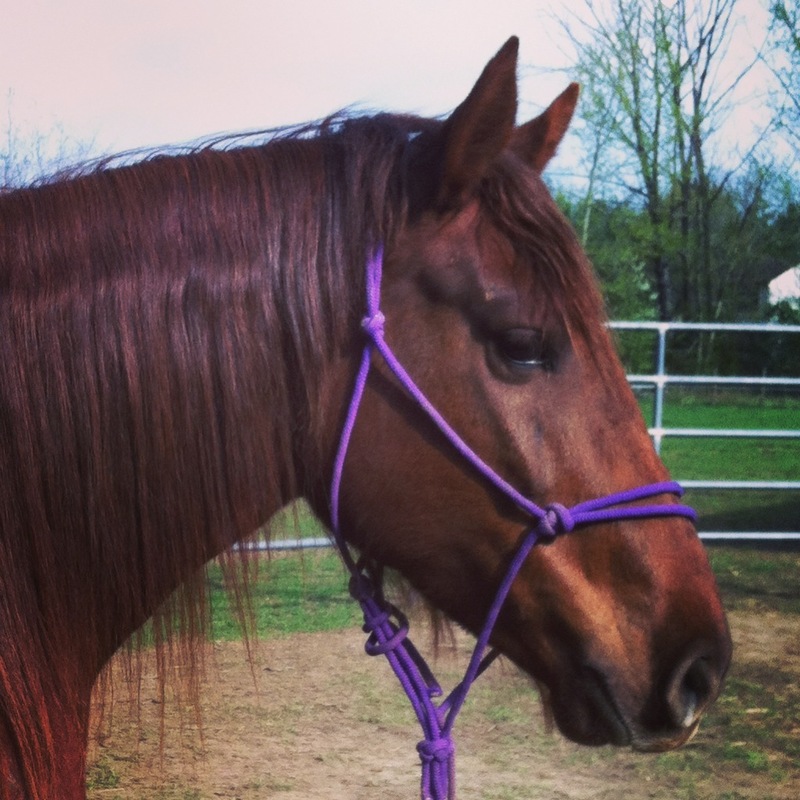 It is a fourteen and a half hour drive to where I need to be to pick up this horse. Mind you, fourteen and a half hours of a wild horse in a trailer. Alone. I hope all goes well. 5 Happiness. I am lucky enough to spend my time doing something I love. Also, I think this year is geldings since two other events are. We’ll see! Time to Get Ready to Get Back in the Saddle! 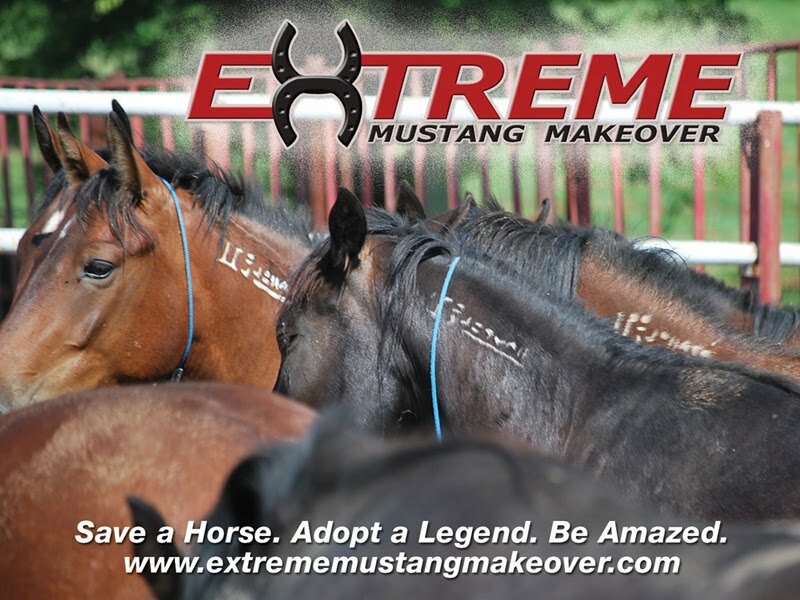 Due to low funding of the Mustang Heritage Foundation, the organization who holds the Extreme Mustang Makeover, events were cut from the program. At first, there were no events along the east coast. Thankfully something changed. As of now there will not be an event in NJ at the Dream Park but there will be one in Pennsylvania– my neighbor state. So after committing my warm days to training Paisley, I want to compete again. I want to save another mustang. So here I am between a mustang and another mustang. I think I can train both and keep my part time job. Sometimes. The application deadline for the PA event is April 15th. The thing is, I have read way too many articles about the Bureau of Land Management and the roundups out west. The bottom line is, they captured so many horses, they don’t have too much more room to keep them, let alone the money to feed them. 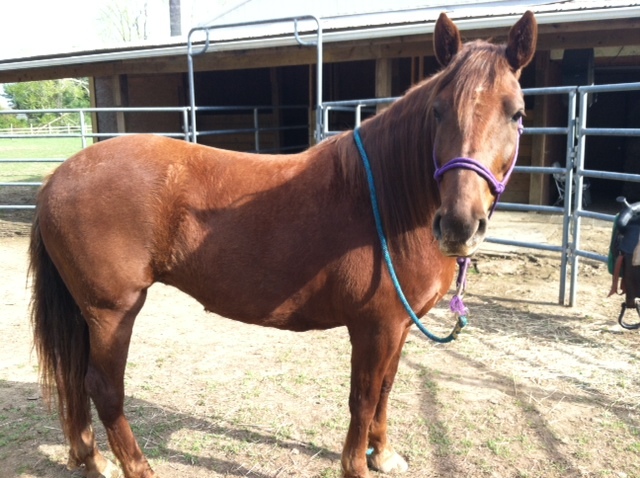 It is also brought to attention that they deny mustangs shelter that they require adopters to have. As of now, it sounds like there aren’t many other options. The BLM looked to slaughter, which isn’t solving the problem, it is hiding it. Furthermore, unfortunately banning slaughter in the US does not stop it in Mexico and Canada. An option is contraceptive programs, but it seems to only be effective for a few years and the BLM prefers to spend money on roundups. 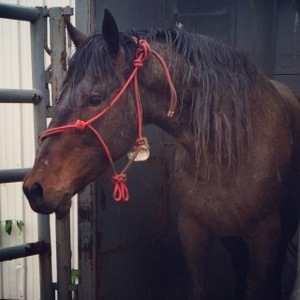 Now, I am not telling you this because say I hate the BLM, or I want to start a debate; These are just the things I read about, that makes me want to help the mustangs. So, I’m looking at this EMM as an opportunity to help. Why not spend my summer with horses and save a life while doing it? I have to admit, I am not a horse person in the winter. It’s too cold. And I hate the cold. In case you don’t live in South Jersey, let me tell you a little bit about our recent weather situation. One day its raining and in the 40s. Day two consists of a bright sun and temperatures in the mid 50s, but don’t get too excited.. Day three is snow and more snow with a wind chill in the negatives. WHAT. Anyway, without a large heated indoor (that every horse person wishes they could have) I do not ride. This means Paisley has had no meaningful exercise in quite a while. First, I hope everyone’s enjoying their summer so far! Paisley is amazing. Paisley my EMM mustang. “Horses are smart” has become an understatement. Yesterday was a pretty big day. I rode her in the arena (for the first time) and she is a little afraid of the far end. After some convincing and a few bucks, we traveled all the way around along the rail. We basically walked, turned, flexed and stopped. After all, you must learn to walk before you can run. She is also into this new trick where she can rub her halters off. She literally rubbed the hair off the side of her nose trying to get her halter off. I have walked out in the morning and found Paisley standing in the round pen with a halter dangling from her head, not once, but twice. It’s okay if it was all the way off, but since it was still around her head, it could have been dangerous. She could have rolled and got her leg stuck in it or got it caught on something and spooked and really hurt herself. As a result of these consequences, I have been removing the halter at night and putting it back on in the morning. She could use the practice anyway. Another big thing yesterday was loading in the trailer. She did it! I had to ask my boyfriend for help because the last time I tried, it was unsuccessful. 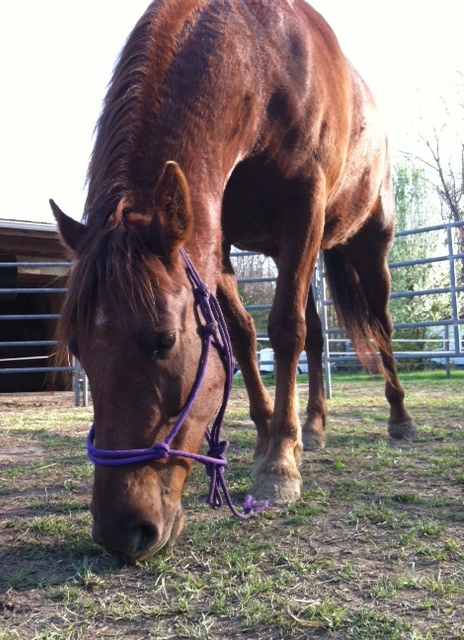 Picture me standing in a two-horse stock trailer, holding a rope attached to Paisley’s halter. Good. 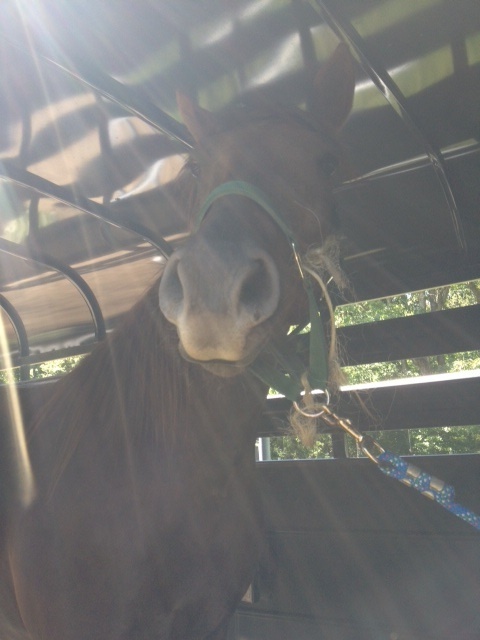 Now Paisley, standing just at the back of the trailer with her feet firmly planted on the ground and her neck stretched out so her head and neck both are in the trailer. That’s it. Both of us stood like that for an hour until I gave up. Of course, every once in a while she would try to fly back and thrash her head around like she was saying “There’s no way! No way! You can’t make me” and maybe she was. Don’t forget if you’re on Facebook, we have a page set up to document our progress. Like us! I would like to thank everyone who has read my blog, even if it was just once. As the semester comes to an end, so will my blog in a formal way. I expect to keep posting, especially about Paisley. Also, I will try to incorporate some other horse related things I learn along the way. I have learned that Journalism is NOT my thing, and that I will be leaving Rowan so I can switch my major back to Animal Science. However, I did learn a lot about writing for my readers and I hope that I did well in that sense. Also, if anyone is interested: this Friday, May 10, the Eastern Pennsylvania Reining Horse Association is having a spring show at the Dream Park. I plan to go as long as I don’t have to work. 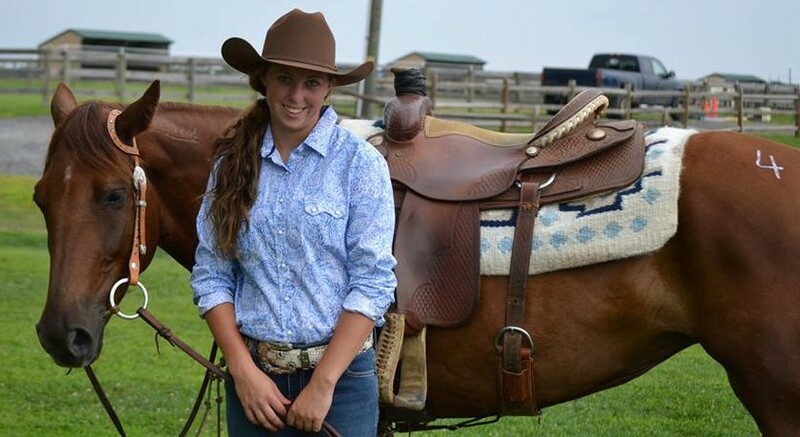 Reining is amazing, don’t miss out on this opportunity! That’s all for now. Thanks again. When I first applied for Extreme Mustang Makeover (EMM), I had no idea what I would be getting myself into. As I awaited the decision to be trainer, I got more and more excited. Upon acceptance, I was overjoyed. The training, hard work, and time I would have to put in, weren’t a problem, but a story. Already a month has flown by and I just want to share the progress I have made with Paisley. Granted, I am no professional horse trainer, just a girl who has been riding and working with horses for about eight years. Day 1 was April 6, 2013 when my dad and I drove in a truck with a trailer down to Lorton, Virginia to pick up my mustang. I had no idea what number, color, or temperament horse I would be taking home. It took us about three hours to get there. After signing some papers the lady doing the office work told me “You have a chestnut. She is about five years old.” Her number was 9919 so I anxiously went to the holding pens to find her. Day 2 I spent all day with Paisley, mostly trying to come up with a name, but also allowing her get familiar with me. I even got to touch her. On Day 3 I could touch Paisley all over, so next we introduced the brush. We working on standing while being pet and brushed all over. Next, we worked on leading. Day 4 was a little more in depth. Of course, I started with approaching and brushing Paisley. We practiced some leading and then I brought out the saddle pad and saddle. At first, she didn’t like either one. She snorted and backed away from them. After talking to her and giving her time, I could finally walk up to her with the item in my hand. So the next thing i did was kind of brush the object on her body to let her know it is okay. By Day 5 I was amazed by the progress we had made so I decided I would climb onto Paisley’s back. She’s a little too tall to just “hop on” so I brought her close to the fence, climbed up the rails, and slid on. I only sat there for a minute or two, before something crazy happened. Of course, she was fine with me sitting there so I climbed down. On Day 6 I worked on saddling and unsaddling with Paisley. After all, you can never practice too much. Day 7 was pouring rain so we didn’t get to do a whole lot, but we worked on picking up feet… in the mud. I’ve learned the most important thing about horse training is repetition. It’s funny how one day Paisley would do something fine and then two days later act like she didn’t have a clue what I was trying to do. Nicky Franchette, another trainer competing in the EMM this year from New York, agreed by saying “Don’t think that what worked for you before will definitely work today- Try something different.” And that is just all part of the fun! Another important aspect is confidence. Horses can sense the way humans are feeling, so if I were really scared and nervous about working with Paisley, she would take advantage of that and we probably would not have accomplished what we have. For more information, check out the timeline I’ve put together for “events” that happened over the past month.